Richmond Park Mennonite Brethren Church building, 2017. The Richmond Park Mennonite Brethren Church in Brandon, Manitoba began in 1954 as the Gospel Light Mission, a ministry to rural people who sought employment in the city of Brandon. Under the leadership of Abe Froese evening services were initially conducted in a rented house. On 21 November 1954 a dedication took place. In spring 1956, Lawrence Warkentin became the pastor and the services were moved to the Forresters Hall. On 20 August 1957 the church had a sod-turning ceremony for a new building. The first baptismal service was held in June 1959. The church was accepted into the Mennonite Brethren Church of Manitoba in 1960 as the Brandon Mennonite Brethren Church. In 1973 the Alexander Mennonite Brethren Church joined membership with the Richmond Park MB Church. The congregation was formerly known as Brandon Gospel Light Mission, Hillside Mission, and Brandon Mennonite Brethren. Canadian Mennonite (6 May 1955): 5. Klassen, Peter G. "The Development of a New Frontier." 1970, 2 pp. Centre for Mennonite Brethren Studies. Loewen, Henry. "History of the Gospel Light Mission of Brandon." n.d., 3 pp. Centre for Mennonite Brethren Studies. Mennonite Brethren Herald (27 May 1988): 37. Epp, Marlene and Sam Steiner. "Richmond Park Mennonite Brethren Church (Brandon, Manitoba, Canada)." Global Anabaptist Mennonite Encyclopedia Online. March 2012. Web. 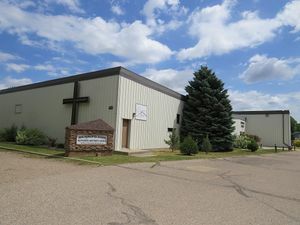 18 Apr 2019. http://gameo.org/index.php?title=Richmond_Park_Mennonite_Brethren_Church_(Brandon,_Manitoba,_Canada)&oldid=148881. Epp, Marlene and Sam Steiner. (March 2012). Richmond Park Mennonite Brethren Church (Brandon, Manitoba, Canada). Global Anabaptist Mennonite Encyclopedia Online. Retrieved 18 April 2019, from http://gameo.org/index.php?title=Richmond_Park_Mennonite_Brethren_Church_(Brandon,_Manitoba,_Canada)&oldid=148881. This page was last modified on 9 June 2017, at 19:31.